If you are in the field of aging and/or new or somewhat new to the grant-writing process, Grant Writing for Aging Services and Programs is for you! 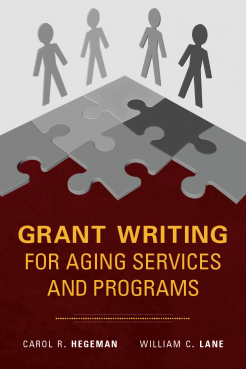 In addition to the standard information on writing grants, the authors provide fictitious but realistic case studies of three aging service providers as they to respond to a grant opportunity. Susan Kingsbury-Comeau, Executive Director, Mt. Si Senior Center, North Bend, WA. Arleen Evans O’Reilly, Director, VI Family Caregiver Support Program, St. Croix, US Virgin Islands. Karl Pillemer, Director Bronfenbrenner Center for Translational Research, Hazel E. Reed Professor in the Department of Human Development Cornell University and Professor of Gerontology in Medicine at the Weill Cornell Medical College. William T. Smith, President/CEO, Aging in America, Inc, Past President of AAHSA (now Leadingage) and Licensed Nursing Home Administrator. Carol Hegeman, MS, was, for over 30 years, the Director of Research at the Foundation for Long Term Care (FLTC) in Albany, NY. In that position, she successfully wrote and successfully managed numerous funded demonstration and research grants that benefited elder care providers and the people they serve. Five of these grants received state or national awards. Carol received the American Society on Aging’s 2008 Gloria Cavanaugh Education & Training Award. William C. Lane, PhD, is emeritus faculty member of the State University of New York (SUNY) Cortland and the founding Director of the Center for Aging and Human Services. He is the owner of the gerontological consulting firm William Lane Associates. Bill is a past president of both the State Society on Aging of New York (SSA) and Sigma Phi Omega National Honor Society in Gerontology. He is a recipient of the Walter M. Beattie, Jr Award from SSA. Both authors are reviewers of governmental grants and the book shares valuable knowledge gained from that review experience.